The Winter Star Party Page!!! © 2011-2015 Ted Saker, Jr. All rights reserved. Remember, I sue people professionally. Besides astronomy, it's what I live for. Journal (but no images I'm proud of) from WSP 2015! WSP 2015: Says it all. "We were only clouded out one night." Craig C., with Keith V., enjoying his first WSP (2015), before the big chill. March 1, 2015. The 31st Winter Star Party took place February 16 through 21, 2015. This journal was easy in some ways to write as there was little imaging activity. This edition resembled a combination of 2007, 2009 and 2010. Monday the 16th turned out to be the only opportunity to shoot any image. There was an occasional gust of wind that squiggled the stars and subject, but since the first night is for equipment checking, I turned in early when a large cloudbank came through. I have a couple of test frames that I may process, but it is unlikely that I'll post it. 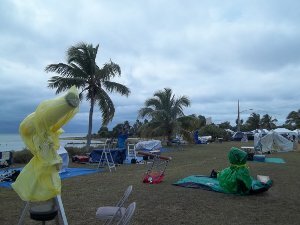 Tuesday night brought a large thunderstorm to Scout Key. 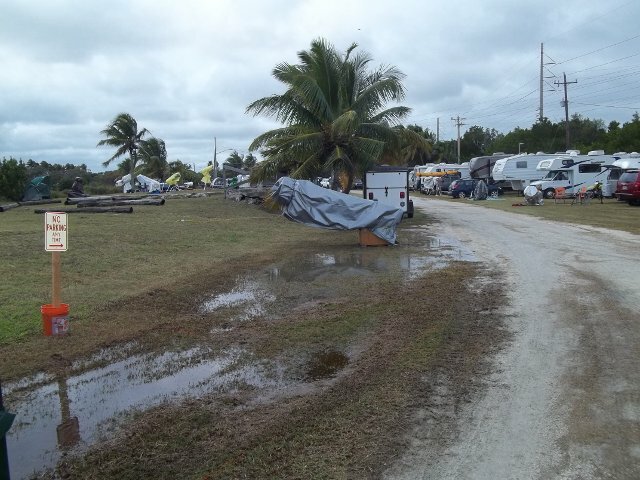 It left many submerged campsites and telescopes in its wake. This event earned the eponym, "Winter Storm Party." In its wake, the storm brought temperatures nearly twenty degrees below average and steady winds in the 30 MPH range. Wednesday and Thursday were clear, but there was no way to shoot images in those conditions. Staying out of the wind and trying to maintain a positive mental attitude in the face of so much cognitive dissonance were significant challenges. Waking up to near record low temperatures on Friday was an uncharacteristic WSP experience. The schadenfreude pouring down from the north with the arctic breeze was no comfort. However, I did see many old friends and catching up with them was great, as was talking about equipment and techniques. The TSP Shade Tree Gang's Fearless Leader, Craig Colbert, made the trip from Santa Monica with a home built tracker that he designed and wrote control software to enable it to track. Robert Royce brought a 12.5" Dall-Kirkham, but I didn't get a chance to look through it at night. That was a pity since Jupiter was just past opposition. I had such plans for 2015. I wanted to get color layers to combine with last year's monochrome Centaurus A, among other goals that went unmet. Here's hoping that WSP 2016 has better conditions. I seriously need to look into a small, high quality refractor for wide field, deep sky imaging. I'm not sure the SAGA is up to the windy challenges of WSP imaging. March 10, 2014. 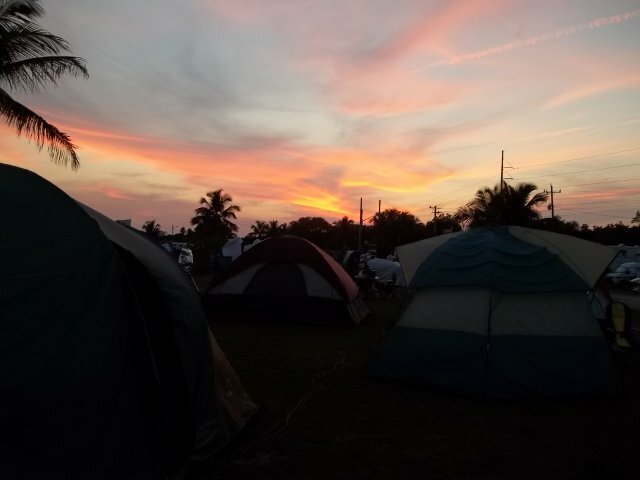 The 30th Winter Star Party was held on Scout Key, February 26 through March 2, 2014. After a particularly brutal siege of Ohio by General Winter, the 30th WSP was a desperately needed respite from the snow, ice and deadly wind chills. Surprisingly, despite GW's ongoing attacks, south Florida did not experience the usual effects of northern winter storms. 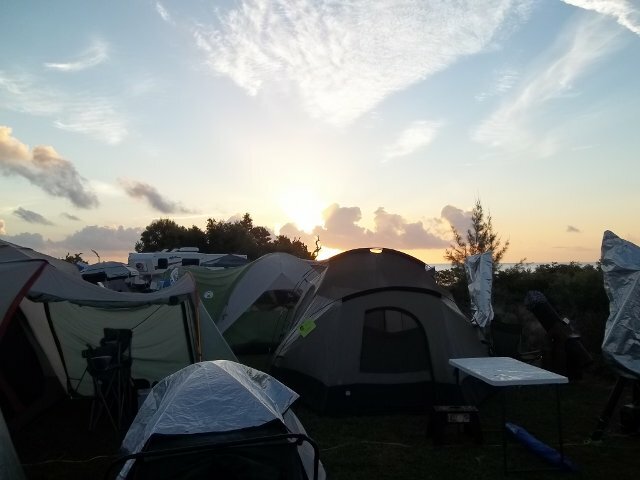 Every 5th anniversary, WSP opens the gates a day early, giving attendees a bonus night under the fabled steady skies of the Straits of Florida. The 60 degree temperature differential between Ohio and Scout Key was warmly welcomed. Upon arrival, I experienced temps in the mid 80s and humidity nearly as high. It felt good. The unfortunate side effects were below normal transparency and above average dewing conditions. 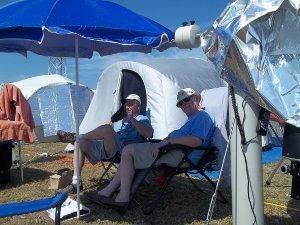 Although Joe Golias did not set up the Astrozap booth this year, he was kind enough to furnish me with a dew shield for my newly reconditioned AT8RC, the big brother to the AT6RC I used at past WSPs, which was making its first star party appearance. Another big event was first light for the SAGA (Scarlet and Gray Astrograph). I designed and built this 6” f/4.5 Newtonian imaging telescope and recently completed it after two years of toil. I hoped to test my work on some wide field objects. 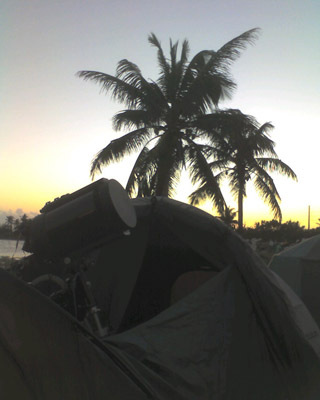 On the first night, the Sunday bonus, skies were clear although the humidity reduced the transparency. I attempted to collimate the SAGA, then set it on the G-11 and mounted the camera. No joy. Instead, I was able to help out a SCAS member having a communications problem with his G-11 mount. When I verified that the computer and mount were talking to each other over my cable, it was apparent that his cable was the problem. Worse yet, the problem was in the DB-9 connector. He looked very worried when I took the connector apart, found a broken wire, and asked for a soldering iron. He need not have worried, as I have made the same repair on my cable in the field several times. After 10 minutes' work, his computer and Gemini CPU were working and playing well together again. Unfortunately, lack of sleep from the drive south caught up to me and my evening ended early. Monday was another uncharacteristically hot and humid day. I spent most of the day collimating telescopes. A visit with my friend, Howie Glatter, provided me with the tools and information that led me to conclude that I had collimated the SAGA incorrectly. Howie's tools enabled me to align the mirrors correctly, but by then I had replaced the SAGA with the AT8RC. I did not want to let WSP pass without getting images and the AT8RC was the better choice to ensure I didn't leave WSP without something to process. Thus, pictures from the SAGA would have to wait. My imaging run would consist of two objects whose placements would provide camera time for the entire night. 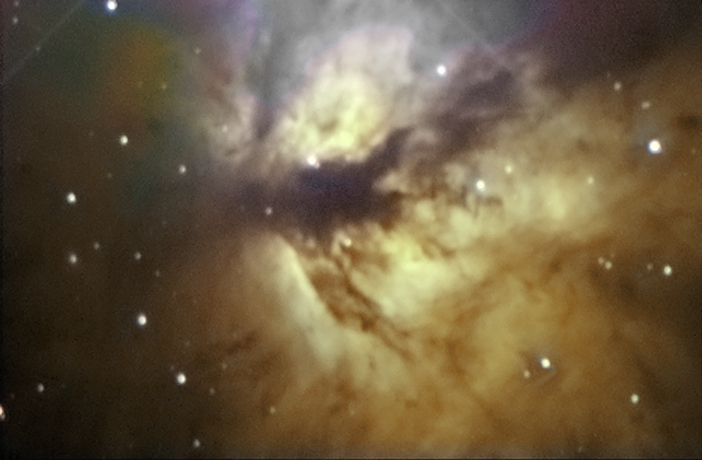 I began the evening with the Flame Nebula (NGC 2024) just off the leftmost star in Orion's belt. The first half of the imaging run was spent acquiring luminance. Since I am pursuing narrowband tricolor imaging, I started collecting hydrogen alpha (Ha) frames after completion of the luminance imaging run. The second object I planned to get was Centaurus A (Arp 153, NGC 5128), in honor of Dr. Halton C. Arp, who passed away on December 28, 2013. I had the honor to meet Dr. Arp at the 2005 Texas Star Party and found him to be a gentleman in every sense of the word and a scientist of the highest caliber. In his Atlas of Peculiar Galaxies, Dr. Arp described Centaurus A as one of the best examples of a "disturbed" galaxy with dust absorption. I'd been after an image of that object for several years. WSP's low latitude meant that Centaurus A would be at its highest altitude there than anywhere else in the continental U.S. Previous attempts had foundered for lack of a bright enough guide star. This year would be different. My camera acquired and held its lock on a guide star, and luminance layers were successfully obtained. The imaging run was cut short by dewfall heavy enough to reach the AT8RC's primary mirror at the back of the tube. I had to discard two raw frames as a result of the accumulation of dew on the mirror. 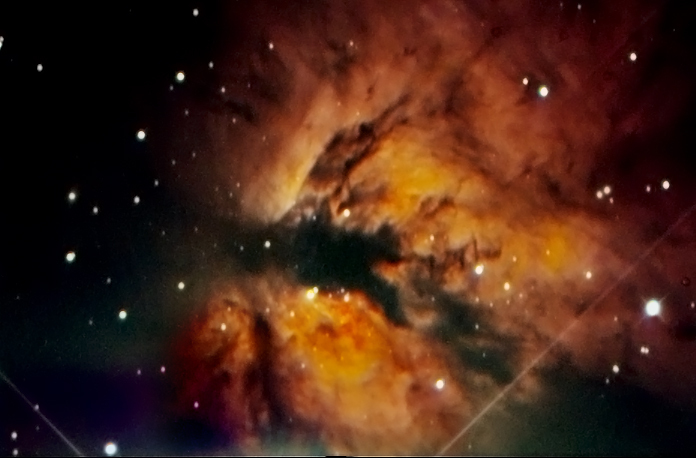 Tuesday night began with promise as I acquired the balance of the Sulfur II (SII) and Oxygen III (OIII) color layers for the Flame Nebula image. 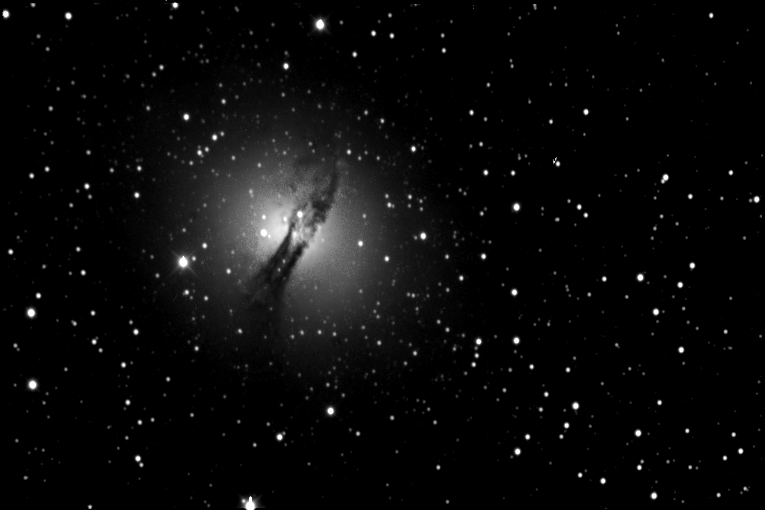 However, clouds rolled in around midnight and the imaging run ended without my being able to obtain any color layers for the Centaurus A image. Occasional wind gusts did not overly interfere with the imaging run. Most of the raw frames were fine. Wednesday night was cloudy and a bit windy. The forecast for the rest of the week was not favorable. The news from home was most disquieting. General Winter was marshaling his forces for another invasion of the Ohio valley on the day of my planned returned home. That left me in a dilemma: stay in south Florida and accept the disruption of my work schedule, or leave early and beat General Winter home. Joe was in favor of the latter plan, and I very reluctantly agreed. We packed up Thursday and began the long trek home. I arrived a half day ahead of General Winter with warm memories of another wonderful, successful, too-short WSP. Arp 153 (NGC 5128) Peculiar Galaxy in Centaurus (“Centaurus A”). 6000 secs. L, AT8RC. WSP 2014. April 4, 2013. Another highly anticipated WSP (February 4 to 10) lived up to expectations. Six straight clear nights, warm temps, not so windy, and lots of imaging. Just getting into the South Florida area was an adventure in and of itself. 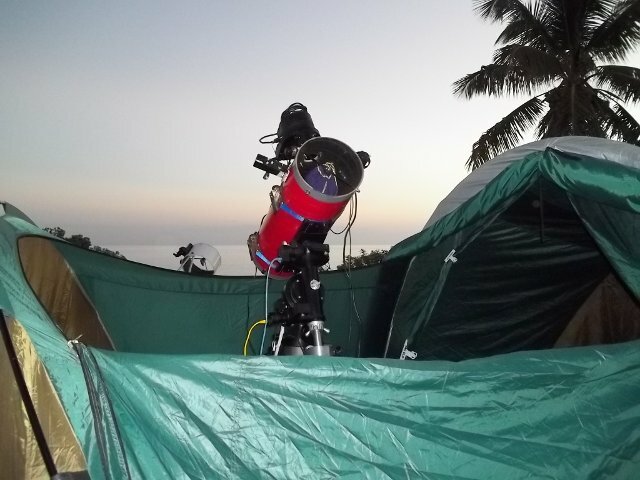 As an extra added bonus, I was given the opportunity to work with the Avalon Instruments M-Uno single-arm equatorial (SAE) mount and write an evaluation for the April-May 2013 issue of Astronomy Technology Today magazine. Luminance layers of the top row of objects I took at Black Forest awaited the acquisition of the color layers which I obtained at WSP. I wasn't as fortunate with some other objects I wanted to shoot due to the absence of sufficiently bright guide stars. However, the images I took with the M-Uno more than made up for the the guide star frustration. At 660 mm, the short focal length of the Intes Maksutov-Cassegrain telescope allowed me to use my camera's full resolution. 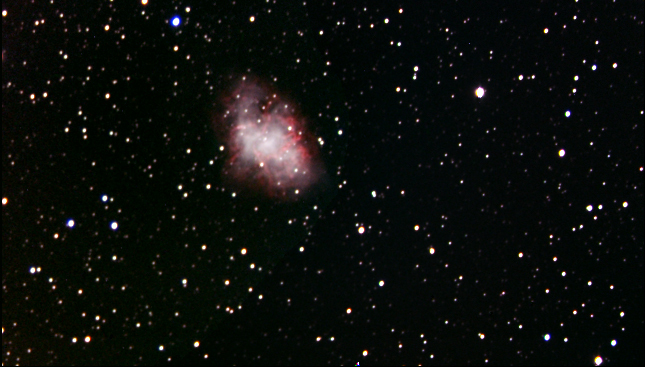 M 76 Planetary Nebula in Perseus (“The Little Dumbbell”). L taken at BFSP 2012, RGB taken at WSP 2013. 9 min. L, 9 min. R, 9 min. G, 13.5 min. B. Image sensor: SBIG ST-8XME/CFW10SA. Optics: AstroTech AT6RC @ f/9. Mount: G-11 GEM. 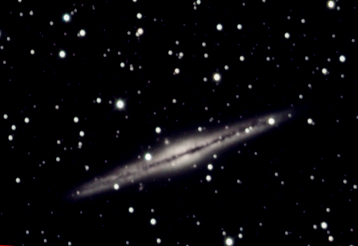 NGC 891 Edge-on Galaxy in Andromeda. L taken at BFSP 2012, RGB taken at WSP 2013. Image sensor: SBIG ST-8XME/CFW10SA. Optics: AstroTech AT6RC @ f/9. Mount: G-11 GEM. NGC 1999 Dark Nebula in Orion. 40 min. L only. Image sensor: SBIG ST-8XME/CFW10SA. Optics: AstroTech AT6RC @ f/9. Mount: G-11 GEM. 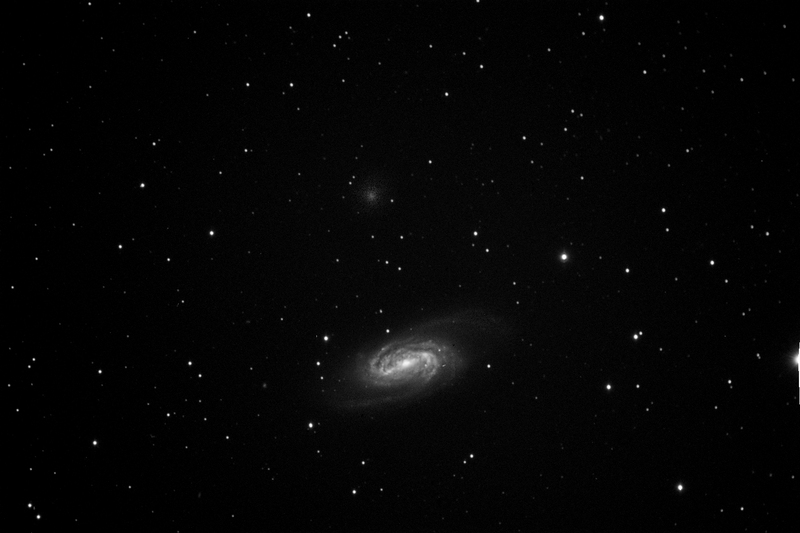 M 65, M66 & NGC 3628 Spiral and Edge-on Galaxies in Leo (The Leo Triplet) LRGB Image sensor: SBIG ST-8XME/CFW10SA. Optics: Intes MN 110 @ f/6. Mount: Avalon M-Uno SAE. 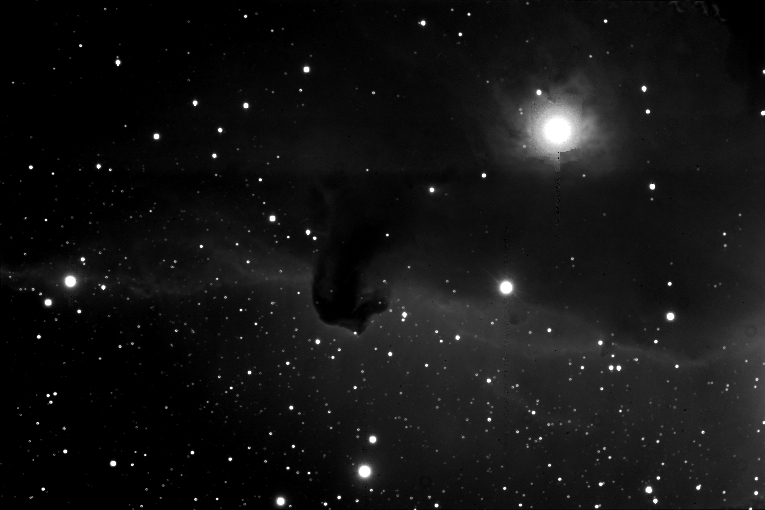 Bernard 33 and IC 434 Dark and Emission Nebulae in Orion (The Horsehead Nebula) L only. Image sensor: SBIG ST-8XME & CFW10SA.Optics: Intes MN 110 @ f/6. Mount: Avalon M-Uno SAE. NGC 2093 Spiral Galaxy in Leo-L only. Image sensor: SBIG ST-8XME & CFW10SA. Optics: Intes MN 110 @ f/6. Mount: Avalon M-Uno SAE. March 2, 2012. WSP 2012 (February 20-26) is in the books. The weather and observing conditions were the finest since 2008. I worked the Astrozap booth with Joe Golias again this year. 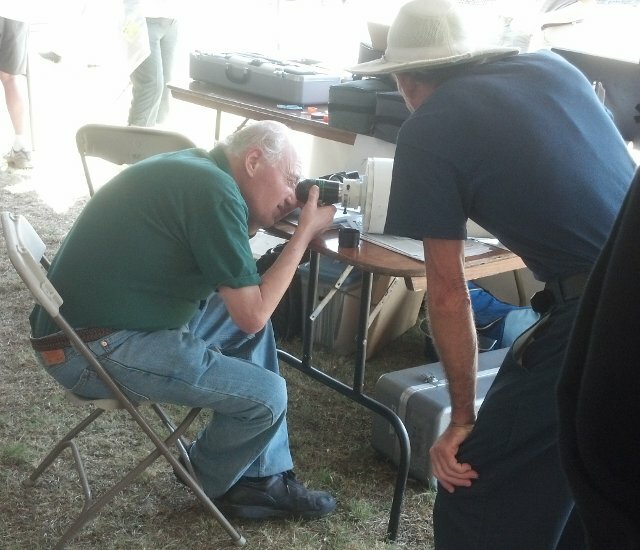 I got to talk a lot about telescopes and astrogear with many attendees. Undoubtedly, the highlight of this event for me was Mars opposition. WSP skies are renowned for steadiness which is ideal for planetary viewing. Robert Royce was in attendance. One of the attendees commissioned a 16” DK from Robert, and the view of Mars through that scope was nothing short of stunning despite some annoying wind gusts. Sinus Sibaeus, Syrtis Major and the South Polar Ice Cap were easily visible even though this year's apparition is not a particularly close approach. I took a different approach to imaging this year. Anticipating windy conditions, I left the C-11 at home and brought an AT6RC, a 6” Ritchie-Chretien reflector, thinking that a smaller, lighter telescope would not be affected as much by wind. Monday and Tuesday were a bit windy. I spent both nights working the kinks out of the new configuration. Wednesday and Thursday were absolutely ideal with Wednesday being the better of the two nights. All four stars of the Southern Cross could be seen, and Eta Carina was visible with the ol' Mark 1 eyeballs. 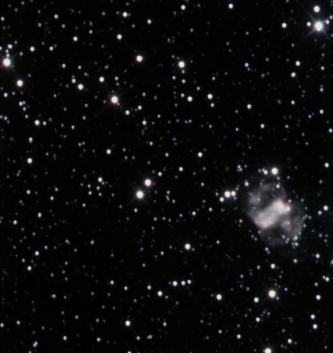 I finally got to image Eta Carina, the Jewel Box and Omega Centauri after years of futility (see above). A previously scheduled family commitment required me to leave a day early. By others' accounts, Friday night was also excellent. Unfortunately, I had to miss it. Working the booth prevented me from enjoying many of the available activities; yet, I managed to make my annual pilgrimages to the No Name Pub and Keys Fisheries. Daytime highs reached the mid 80s and nights were spent in the low 70s. 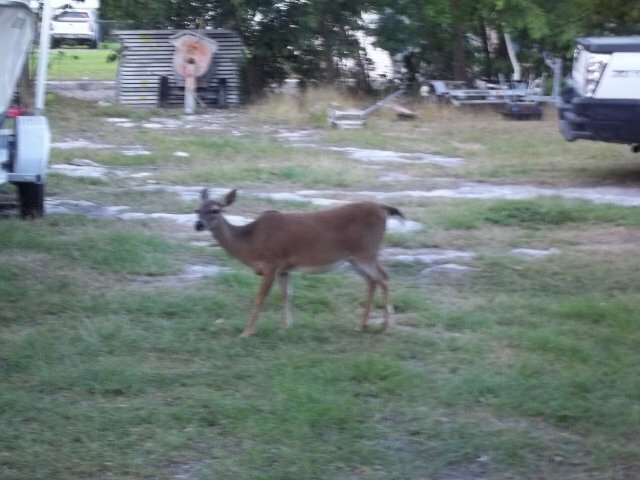 On Wednesday and Thursday nights, when the winds were calm, there was a lot of dew and visits from Florida state birds. 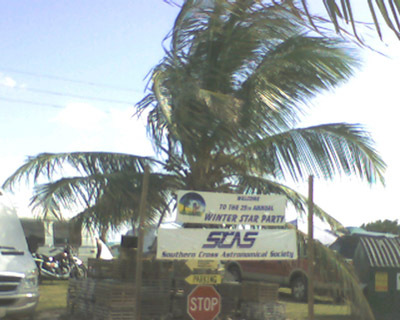 Overall, WSP 2012 was a most successful event. I'm looking forward to WSP 2013. NGC 2359 Emission Nebula in Canis Major (“Thor's Helmet”). Image taken at WSP 2010. Image sensor: SBIG ST-8E/AO-7. Optics: Celestron C-11 SCT @ f/10. Mount: G-11 GEM.Thanks to Joe of Astrozap for the Focusing Cap! 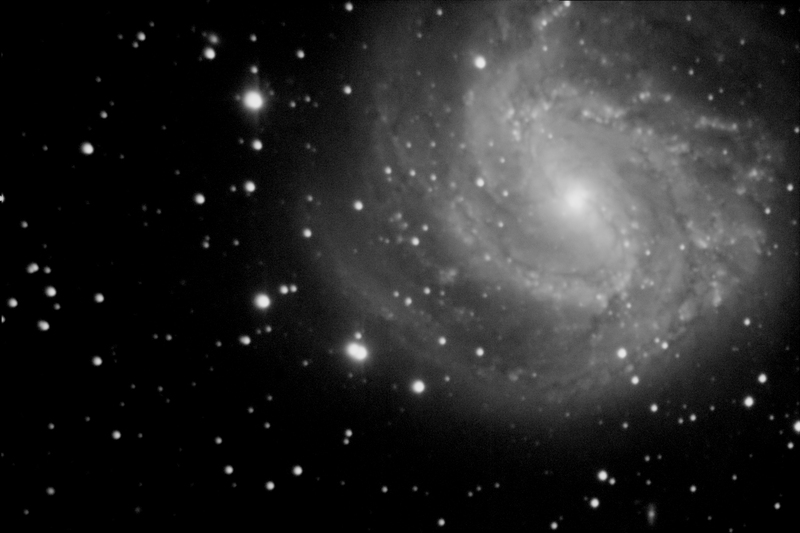 M83 Spiral Galaxy in Hydra (“The Southern Whirlpool”). Image taken at WSP 2009. 60 min. L. Image sensor: SBIG ST-8E/CFW10SA/AO-7. Optics: Celestron C-11 SCT @ f/10. Mount: G-11 GEM. 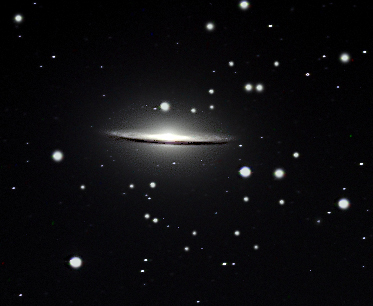 M104 Spiral Galaxy in Virgo (“The Sombrero”). Image taken at WSP 2011 (in a 20 MPH gusty breeze). 5 min. LRG, 10 min. B. Image sensor: SBIG ST-8XME/ CFW10SA/AO-8. Optics: Celestron C-11 SCT @ f/6.3. Mount: G-11 GEM. 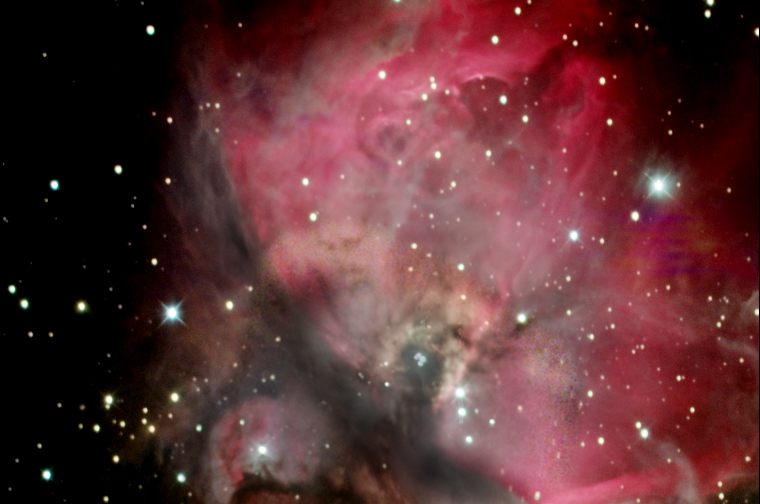 M42 Emission Nebula in Orion (“The Great Orion Nebula”). 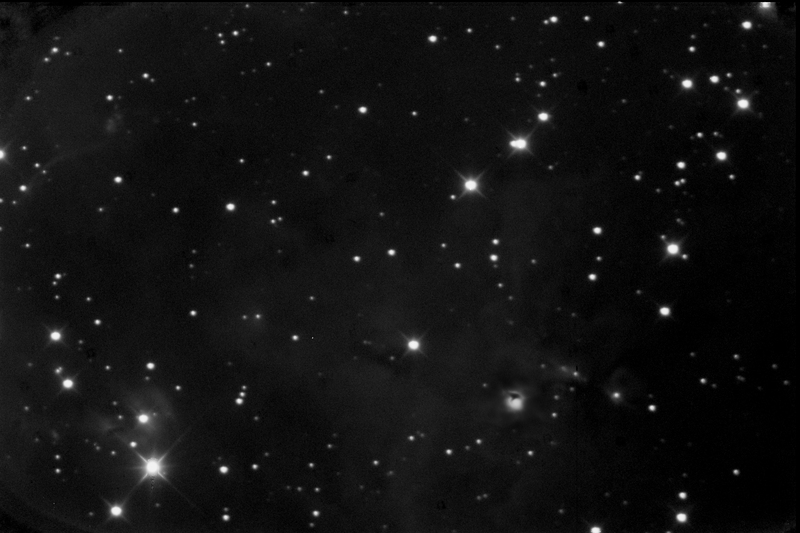 Image taken at WSP 2011 (in a 20 MPH gusty breeze-short subframes of a bright object really helps the guiding). 50 sec. L, 100 sec. R, 200 sec. G, 300 sec. B. Image sensor: SBIG ST-8XME/CFW10SA/AO-8. Optics: Celestron C-11 SCT @ f/6.3. 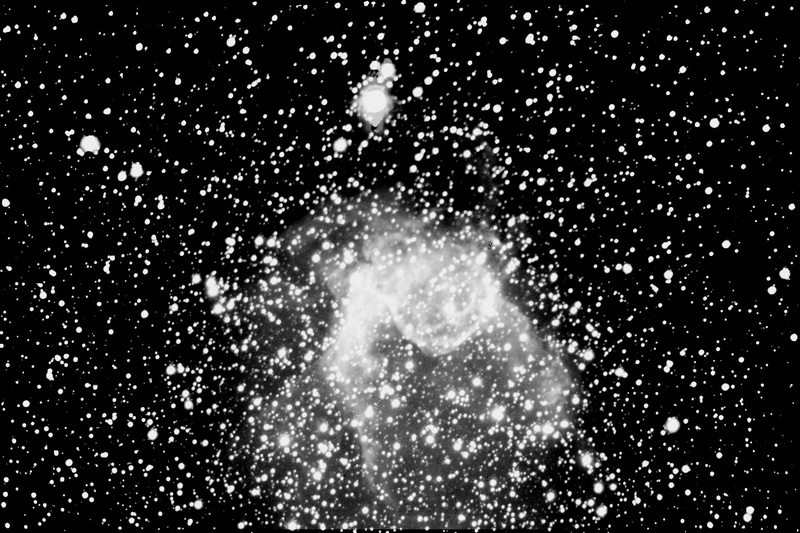 Mount: G-11 GEM M1 Emission Nebula in Taurus (“The Crab”). Image taken at WSP 2011. 45 min. LRGB. Image sensor: SBIG ST-8XME/CFW10SA/AO-8. Optics: Celestron C-11 SCT @ f/6.3. Mount: G-11 GEM. 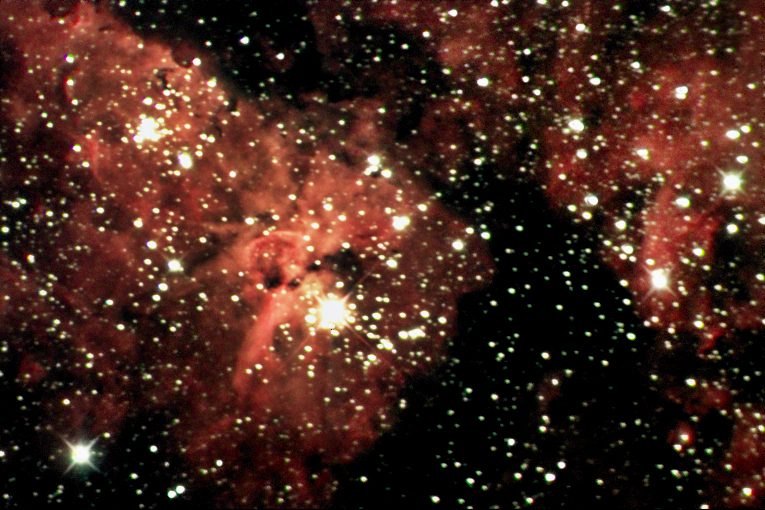 NGC 3372 Emission Nebula in Carina (“The Keyhole” aka Eta Carina). Image taken at WSP 2012. 9 min. L, 9 min. R, 13.5 min. G, 13.5 min. B. Image sensor: SBIG ST-8XME/CFW10SA. Optics: AstroTech AT6RC @ f/9. Mount: G-11 GEM. 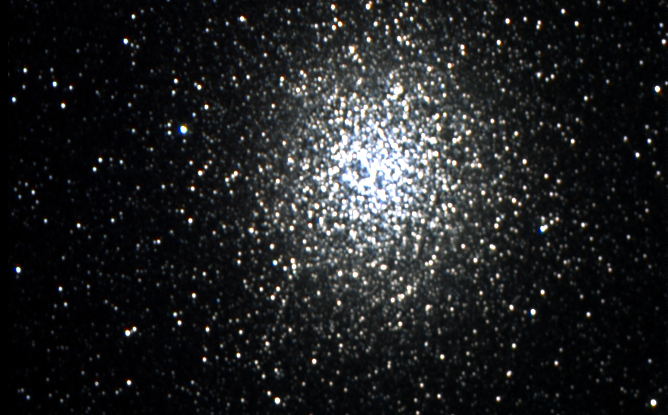 NGC 5139 Globular Cluster in Centaurus (“Omega Centauri” aka the biggest, baddest globular cluster in the sky). Image taken at WSP 2012. 9 min. L, 9 min. R, 9 min. G, 13.5 min. B. Image sensor: SBIG ST-8XME/CFW10SA. Optics: AstroTech AT6RC @ f/9. Mount: G-11 GEM. 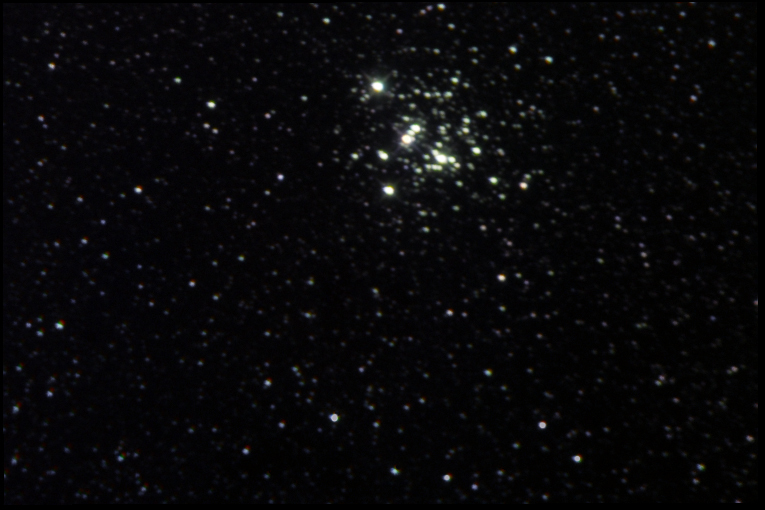 NGC 4755 Open Cluster in Crux (“The Jewel Box”). Image taken at WSP 2012. 9 min. L, 9 min. R, 9 min. G, 13.5 min. B. Image sensor: SBIG ST-8XME/CFW10SA. Optics: AstroTech AT6RC @ f/9. Mount: G-11 GEM. 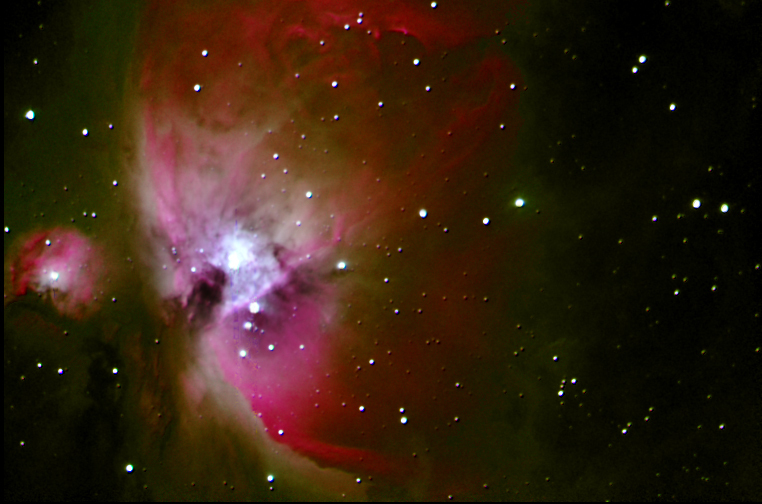 M42 Emission Nebula in Orion (“The Great Orion Nebula”). Image taken at WSP 2012. 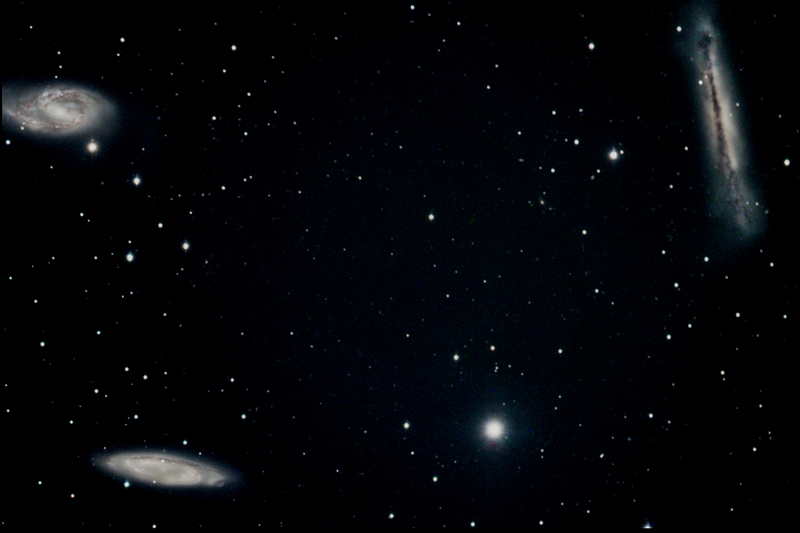 Composite of 18.2 min. L, 31.7 min. R, 27.2 min. G, 22.7 min. B. Image sensor: SBIG ST-8XME/CFW10SA. Optics: AstroTech AT6RC @ f/9. Mount: G-11 GEM. My imaging experience at all the WSPs is one of ongoing frustration. Either the weather refused to cooperate or equipment problems prevented or limited my opportunities. Consequently, I have not had much in the way of results to post. The people having consistent success imaging at WSP use short focal length refractors and/or huge, beefy mounts. My C-11/G-11 combination does not track well in windy conditions. That being said, nobody should get the impression that I'm dumping on WSP. On the contrary, I return year after year precisely because this event is a party first and stars second. 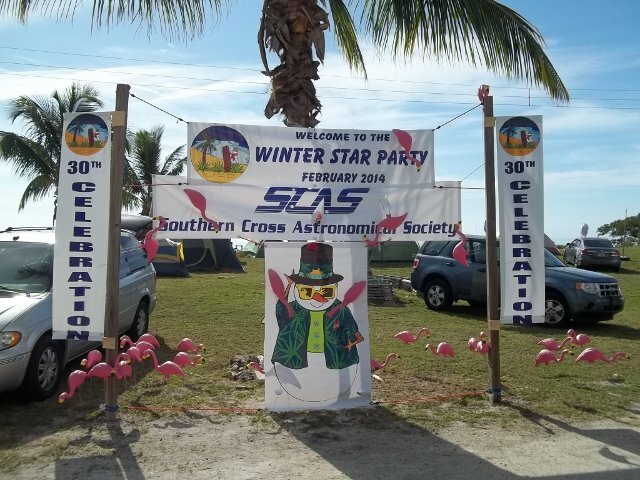 The folks at the Southern Cross Astronomical Society and attendees who travel from near and far make up a wonderful group. 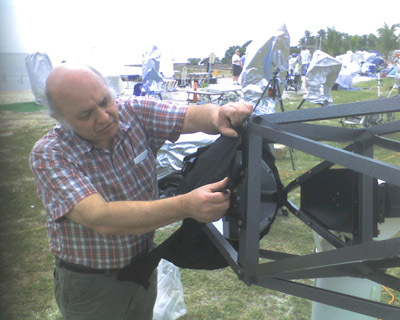 In 2008, three years of disappointment with my C-11 ended when Steve Keene (a fellow CAS member) taught me how to collimate the telescope properly. I observed Saturn as I have never seen it before-the planet filled a high power eyepiece's field of view and I could even see the inner crepe ring. It's a formula for success: February + Florida Keys = A Real Latitude Adjustment. When conditions are right, it's a great site to image from. Plus, there's the opportunity to observe (and possibly image) objects located deep in the southern hemisphere that never get above the horizon in northern latitudes, as well as old favorites that never looked better. For example, in 2006, conditions were so good that we could see all four stars of Crux reflecting in the water of the Florida Straits. The Keyhole Nebula was easily seen with the eyes, and in a telescope—unbelievable. Since these objects attain just seven degrees of altitude at culmination, it was unusually good. In my experience, Cuban weather tends to affect transparency and seeing in that direction. Also, in 2006, the planets put on quite a show. At the zenith, Saturn sat just to the west of the Beehive Cluster and, in the western sky, Mars's location just east of the Pleiades added to the astronomical riches strewn across the heavens. Only in the last couple of years have I been able to get my equipment to cooperate when the weather does. Below are images taken at WSP 2009, 2010 and 2011. Even though I have taken a very few number of images at WSP, I felt it was time to create a page dedicated to one of the finest events of its kind. One of these years, my equipment will work properly when conditions are right. I expect to add to my image collection at a WSP with 2006 conditions. Regardless of the weather, the camaraderie at WSP is excellent. In the final analysis, it is the people that make a star party great. I don't want to miss WSP regardless of the weather, equipment or any other pedestrian concern. Clear, Dark and Steady Skies!